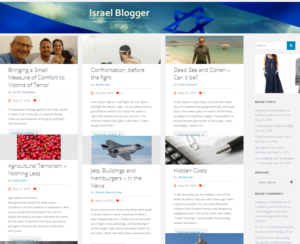 Israel Blogger is for ALL bloggers – right, left, extreme right, extreme left, even center (center left or center right). Nothing will be censored – nothing. Really. Each person holds copyright for their own materials. All posts will be promoted. Readers will be encouraged to post comments, including links; and bloggers will be encouraged to “counter-blog” – argue the points in a post of their own, and then add a link to their post on the first one. What’s in it for you? Why ANOTHER platform? We hope this will be the a very popular platform because of its open agenda…or more accurately, lack of agenda. So you will be part of a total voice. Sometimes you’ll agree, sometimes not. Build up a base of content to justify gaining loyal readership. Ultimately, what we believe we will have are two types of bloggers – guests & regular. Guests are those who will write occasionally; regular ones are expected to write on a regular basis to help build a following. You can easily start as one and move to the other (or back and forth). Obviously, it is likely that a guest blogger will have a lower page view count than a regular blogger (but not necessarily). The fundamentals – a shared profiting agreement, will not change. Our goal is to finally give bloggers a place where their voices are heard loudly and clearly around the world, while their hard work is rewarded – even in a small way. We will NOT have a featured column because this is too often abused. We might have a FIRST-TIME column to introduce new people. We might have other ways to bring attention to specific bloggers, but they will be fair (for example – if we run a bloggers from the north promotion, we WILL run one promoting from the south, center, etc. We will do our best to promote all posts as often as we can on a regular basis and are already preparing the infrastructure for this now. We don’t know how big we will get – obviously, we hope for large numbers of posts and visitors – but quality will always be an issue and we will work together with bloggers to make this site a success. We hope that you will monitor each of your posts and respond to comments. There is no requirement for exclusivity (though we are more likely to work harder to promote exclusive posts than those that appear in many other areas). We do not allow the platform to be used for commercial profit – i.e. write your heart out but don’t try to sell stuff. Calls for the death of innocents (any innocents). Note – if you call for blowing up Jerusalem, you’re gone from the site; if you call for blowing up Khan Younis, same thing. BUT, you can call for the utter destruction of a Hamas area within Khan Younis; you can call for the annihilation of all terrorists. It’s a fine line and we’ll have to work on this one together. We ask commenters to follow the same rules. You don’t have to promote your articles – but we encourage this strongly.